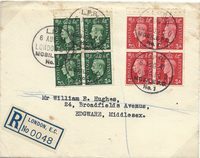 1951 George VI 2d Red-Brown Postcard showing DRY PRINT. Very fine unused. 1937 1d Scarlet, SG 463. Overprinted 'CANCELLED' and PUNCHED, Type 33p, Spec QB10c. Unmounted Mint.